The current UFC Heavyweight Champion, Junior “Cigano” Dos Santos has gone through a knee surgery last wednesday to repair a torn cartilage in his left knee. Using his twitter account, @junior_cigano, Dos Santos said that he will back to his old form soon, following his operation. The champ was injured while training for his title bout for Fox, against Cain Velasquez, held last month in Anaheim, California. 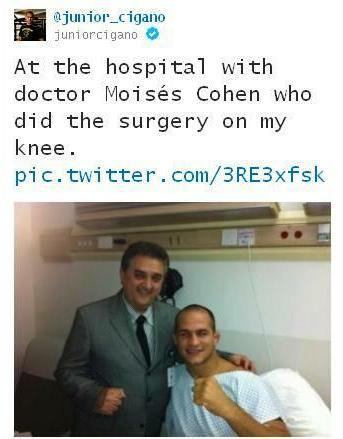 The surgery was done in the Albert Einstein Hospital in Sao Paulo, Brazil.